In the pluralism of world views today the Schoenstatt Mari- an School is an offer to students and their parents. As a free, Catholic school we set great store by providing a basic religious orientation to our pedagogy. 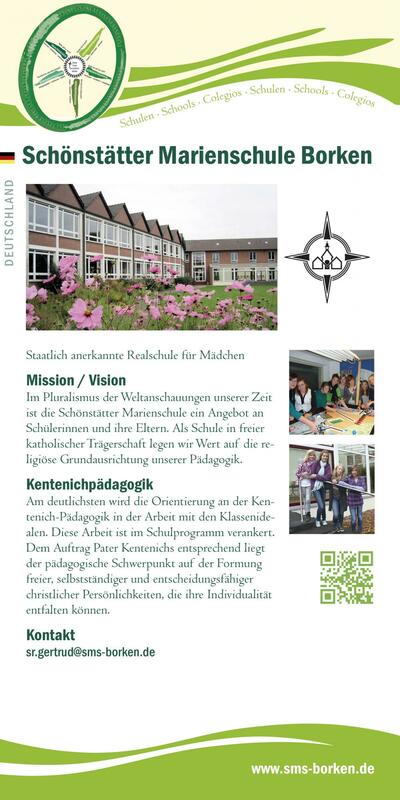 Kentenich Pedagogy The clearest manifestation of our orientation to Kentenich Pedagogy is the way we work with class ideals. This work is an- chored in the school programme. In keeping with our founder‘s commission, our main pedagogical emphasis is placed on the formation of free and independent Christian personalities who are able to decide for themselves, and who are able to develop their individuality.